Benjamin Benjamin has lost virtually everything—his wife, his family, his home, his livelihood. With few options, Ben enrolls in a night class called The Fundamentals of Caregiving taught in the basement of a local church. There Ben is instructed in the art of inserting catheters and avoiding liability, about professionalism, and how to keep physical and emotional distance between client and provider. But when Ben is assigned to nineteen-year-old Trev, who is in the advanced stages of Duchenne muscular dystrophy, he discovers that the endless mnemonics and service plan checklists have done little to prepare him for the reality of caring for a fiercely stubborn, sexually frustrated adolescent. 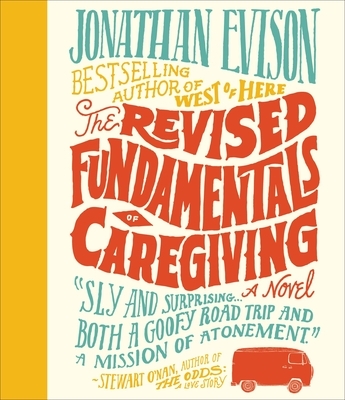 As they embark on a wild road trip across the American West to visit Trev’s ailing father, a new camaraderie replaces the traditional boundary between patient and caregiver. Bursting with energy, this big-hearted, soulful, and inspired novel ponders life’s terrible surprises and the heart’s uncanny capacity to mend and become whole again.